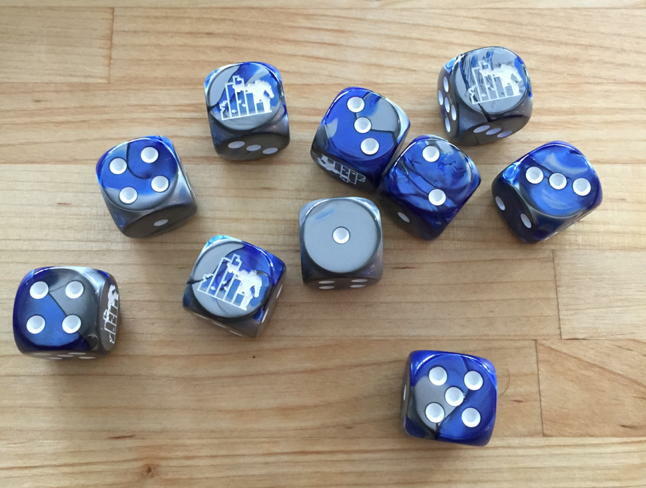 A bit ago I posted an analysis of custom dice – whether folks thought the symbol should be on the six or the one, and if any of the dice I had showed any evidence of being biased towards or away from the side with the custom symbol, etc. You can read about it here. More recently, I’ve seen people posting about ordering custom dice, with army or chapter symbols on them, and others asking about the experience. So, having decided to order a small number of Variance Hammer themed dice, I thought I would chronicle the experience here, to give people a feel for what the process is like, what to expect, etc. Now there are a number of companies that come up when you Google “Custom Dice”, but some of them are more oriented toward “So…you’re making a board game and need 10,000 dice, eh?” I looked at Q-Workshop, but found them to be a little pricey, and their designs to be a little too ornate for a game where I value quickly being able to pick out numbers. Which left me settling on Chessex. Anyone whose been gaming for awhile likely owns a number of dice from Chessex. They’re something of a ubiquitous presence in gaming stores and the like, offering a dizzying array of dice in different patterns. And they can make six-sided dice with custom facings. In terms of customer service, their website is…well, archaic. Their “Click Here To Order” link, which you’d think might be some sort of form is instead just a lot of contact information. The pictures on the website leave a great deal to be desired – small, not really focusing on designs, etc. But once you get past the old school website, I found their responsiveness to be top notch. 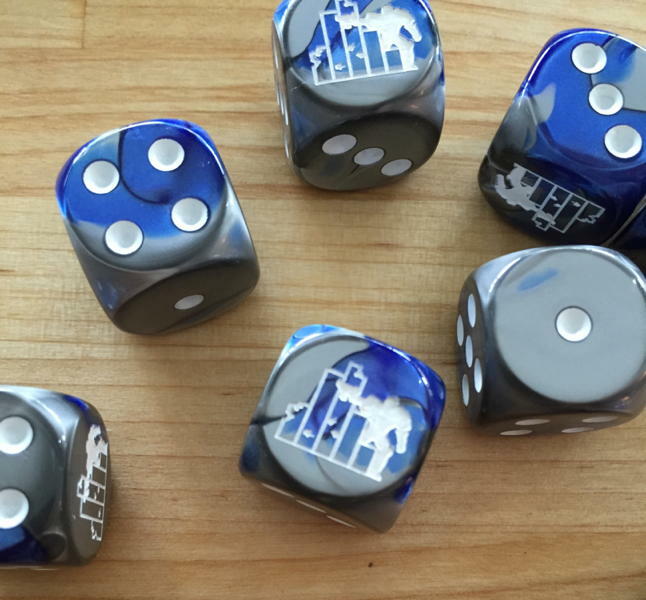 I emailed their general order page with my request – d6 dice in dark blue or purple, with the Variance Hammer logo on the 6 facing, and they got back to me in less than a day confirming they could manage it, and sending me a massive list of the dice designs that they can customize that might fit my criteria. I should note however, for those considering Space Marine chapter logos or the like, that I own the rights to the logo – I don’t know how receptive they will be to requests involving IP that’s clearly owned by someone else. They were similarly responsive when I asked for pictures of some dice patterns that weren’t shown on the website, or that had details that I wanted to make out better, returning with some much higher quality shots of the relevant dice in a little over a day. Three days after giving them the go-ahead, a picture of the prototype die was sitting in my inbox. Price wise, the cost was $1 per die plus shipping, which was via UPS, with a minimum order of 10 dice. They charge $12 for UPS Ground, so the actual out of pocket expense was about $2.20 per die, but this was a small prototype order. For larger orders, the cost should swiftly converge to a little over a dollar per die. For a lot of 16 for example, you’re looking at $1.75 per die, which is about on par with the Games Workshop special edition Harlequin dice, and larger lots also get a discount on the per die cost. The Dice Gods Favor the Custom? I at least think they look good. The logo, which is more complex than most of the symbols that most people would want like runes or chapter symbols, was captured with pretty good detail. The histogram is crumbling like it’s supposed to, you can make out the bullet holes, etc. They are admittedly larger dice (the standard size of GW dice), so folks who prefer buckets of smaller dice for, say, their Orks, might want to look elsewhere. I intend to be using these dice. Unlike the other dice that I tested previously, this one isn’t put out by a game publisher. I think there’s something of a higher standard to make sure your custom dice aren’t accidentally biased – after all, if Games Workshop screws up, there’s likely thousands of people with their dice. If it’s your custom dice, well, it’s just you. So I subjected them to the same test – the set of 10 was rolled together the same way I roll dice when playing games until I had generated 1,000 rolls, to look at both the average and uniformity of the distribution that resulted. While the 6 is rolling at a higher frequency, the distribution still looks pretty darn uniform – and indeed statistically is (p = 0.25). 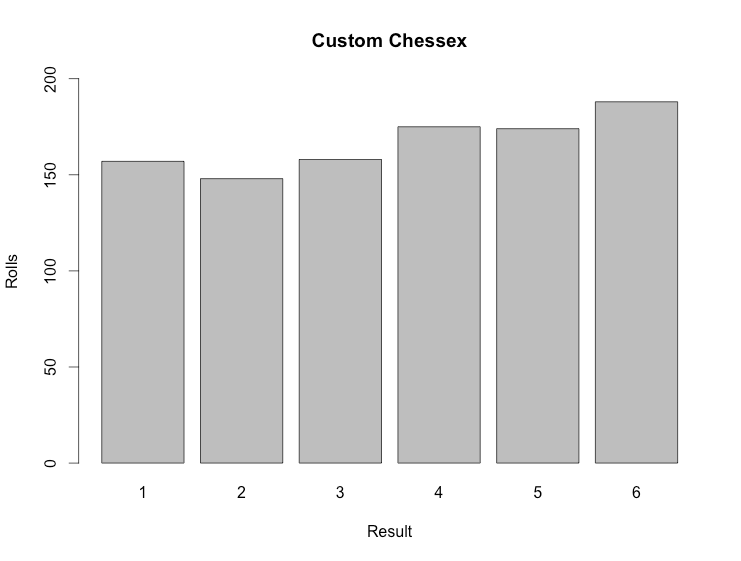 We can see that the higher average also isn’t necessarily coming from a highly biased dice rolling a lot of 6’s – 4 and 5 are more commonly shown than their lower-valued opposite face, resulting in the skewed average. I’d suspect, and the statistical evidence so far supports this, that the average will taper back toward 3.50 if I rolled more dice. Perhaps I’ll try that, but for the moment my wrist hurts, and the results in no way suggests that these are anything other than game ready. Overall, the experience was outstanding, and I’ll be ordering more after this prototype batch. I’m also adding a new tier to the Patreon campaign that supports the content of Variance Hammer. Patrons who support the blog at $5/month, or any of the higher tiers, for a full year, will be sent a set of 10. If you like the content of this blog, and like that it’s ad-free, please consider supporting it that way. I asked them. They prefer to not do copy-righted images.